The ancient Kings' highway in use for 3,000 year, is an ideal route for your Journey south. 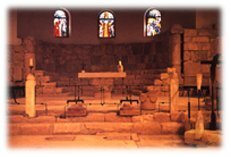 Favorite stop is Madaba, City of Mosaics, to view its wonderfully vivid map of the sixth century A.D. Holy Land. Nearby is the revered Mount Nebo, where Moses climbed to survey the promised land. Visit the site of Machaerus, strong hold of Herod Antipas, where Salome danced for the head of John the Baptist. Jordan is a unique and blessed land of the Old and New Testaments and early years of Islam. The litany of ancient place names reads like biblical gazetteer Edom, Moab, Ammon, Gilead, Gad and Peraea. The Madaba of the Bible is today the small town of Madaba, only 30 kilometers south of Amman. Remains of the Roman road and civic architecture can still be seen in the midst of the modern town, but it is the Byzantine and Umayade mosaics for which Madaba is best known. At the Greek Orthodox Church of St. George visitors may view the earliest surviving original map of the Holy Land, which was made around A.D. 560. In addition, there are other mosaic floors preserved throughout the town, as well as a fine local museum. 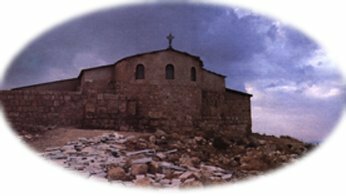 Less than 40 kilometers south of Madaba lies Mukawir, ancient Machaerus. This was the fortress built by Herod the Great, which after his death passed to Herod Antipas. Here is where Herod imprisoned John the Baptist, and where the beautiful Salome danced for Herod, who presented her with the head of John the Baptist to honor her wishes. The remains of the fortress thick walls, which were largely destroyed by the Romans, dominate Mukawir, which has a splendid view across the Dead Sea to the hills around Jerusalem. Ten kilometers west of Madaba is the hilly district of Mount Nebo, on the western edge of the plateau with a spectacular view across the Jordan Valley and the Dead Sea. On a clear day, the spires of the churches of Jerusalem are visible, and at night the light of the city. 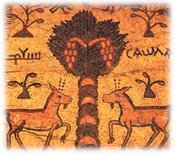 Mount Nebo is believed to be the tomb of Moses. It is a lonely, windswept hill. Protecting the ruins of a 4th and 6th Century church whose floor is still covered with marvelous mosaics, is a building constructed by the Franciscans who started excavating the site in 1933. Um er Rasas is a walled settlement about 30 kilometers southeast of Madaba. Its main feature is a Byzantine tower 15 meter high used by early Christian monks seeking solitude. Archaeologists have also unearthed the Church of St. Stephen whose remarkable mosaic floor of the Umayade epoch is decorated with Jordanian, Palestinian and Egyptian city plans.